Slashing £15 off the rates of competitors Orange and O2, Tescos is offering the latest iPhone, the 3Gs, for a stunning £20 a month bringing the top smartphone of the decade into a price range that many more people can afford. The deal includes unlimited mobile network web access, access to BT Openzone Wifi , and £60 of calls and texts a month. You have to buy the handset first: at £320 for the 16G 3Gs or £407 for the 32G 3Gs. That is £60 worth of calls and texts o UK mobiles, 01, 02 and 03 numbers only. Calls are charged at a flat rate of 20p per minute and texts cost 10p each. Calls and texts to 5 favourite numbers charged at half price: 10p a minute and 5p for texts. Excluding the favourite numbers deal that would mean £60 of credit would get you either 300 minutes or 600 texts. More realistically… that would pan out as something like 200 minutes and 200 texts per month. After the limit is reached calls and texts would be charged at the pay as you go rate. Notably it’s only a 12 month contract as well. O2 and Orange have 18 or 24 month contracts for the latest iPhone. 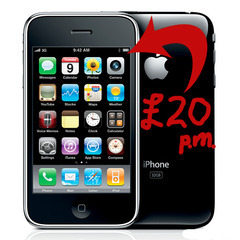 O2’s cheapest deal for the 3GS (16G) is a £45 18 month deal with a £87 down payment. That gets you 1200 UK minutes and 500 texts. Shifting the weight of the cost to the initial down payment could be a good move around Christmas time as it means people are more likely to get friends or family iPhones as gifts – knowing the recipient can afford the monthly bill. Tesco is definitely offering fewer phone minutes than the pay plans of competitors – but it is £15 a month less than either O2 on Orange and that significantly undercuts both of them. why is the iphone £20 a month, but the handset cost £399?